Part of our Christmas decorating allowed me the luxury of making my own side door decoration. In the past I have used a wreath that I previously decorated and re-used each year, maybe changing the trims a little. This year I wanted something with live greens, yet still wanting to keep our expenses low, meaning that I was not planning on purchasing a wreath or new trims. Holiday Frugality 101a: I never throw away trims that are in great condition from prior year decorations and gifts. I remove them and safely put them away for future decorating use. Holiday Frugality 101b: I never buy new trims at full price, or even at 50% off sales. Sometimes one can acquire them at 75% off close to the holiday, but better deals can be found when they stores want to seriously make room and sell off items from 75% – 90% off the SRP. Holiday Frugality 101c: If it is something I can do on my own, then why would I pay someone else to do the job? Plus, I love being creative. As I was placing holiday potpourri, that I let soak in holiday scented oils throughout the year, both my husband and I thought a little greenery would set these little scented containers off quite nicely. Immediately i thought about our side door. As we continued the decorating, I decided to go through my collection of wreath ornaments and trim. 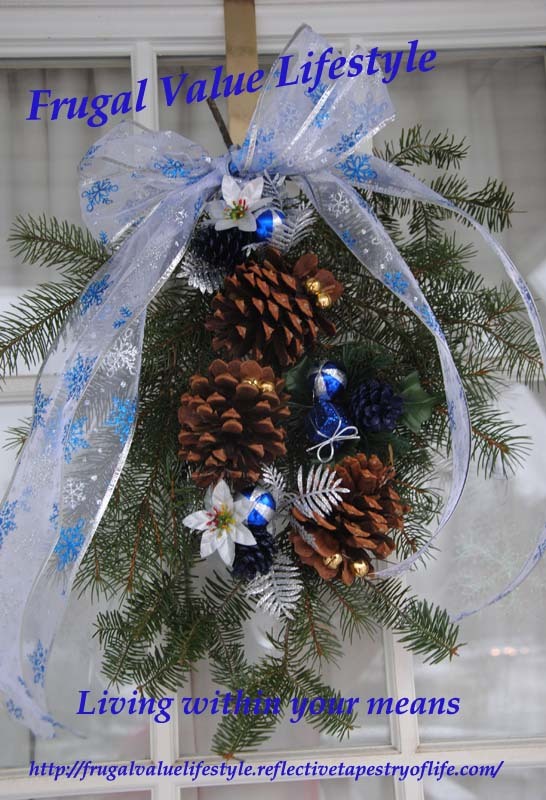 In that stash were blue and silver wreath ornaments, pine cones with bells from a prior year wreath, along with some blue and silver ribbon just waiting for a purpose to be used. So, taking some of the greenery from our yard along with wreath ornaments and ribbon I already had on hand I made a decorative holiday sway for our side door. With a few minutes of my husbands time in cutting the pieces I used, some twine and time, I had a decorative piece that I was pleased and excited to place on our side door welcoming guests to our home. This years decoration was minimal in price as the items came from nature, reused from prior year decorations, yet in pricing out what I did spend on the ornaments and ribbon in a prior year, the cost was just under $3.00. Use what you have while adding a little love and creativity while you enjoy your holiday. Christmas is not about how much you spend, but rather the joy and love you spread.